Order your Chauvet DJ Rotosphere Q3 Effect Light from AMS and enjoy 0% Interest Payment Plans, Free Shipping, Free Extended Warranty & 45 Day Money Back Guarantee. 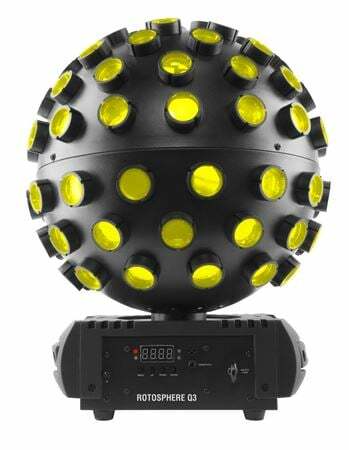 An easy to use mirror ball simulator, the Rotosphere Q3 featureshigh-power, quad-color LEDs. 3 LED zones emit up to 3 different colors simultaneously and slow rotation speed creates a romantic atmosphere. Rotosphere Q3 is easily controllable with the optional IRC-6 remote and the digital display even allows you to set a color and rotation speed without any controller. Mount Rotosphere Q3 to truss with the included bracket or place it on a stand as a centerpiece. I purchased this thinking it would be a good replacement for my mirror ball. It doesn't through the light as far as I thought it would. I like that I can change the colors on the beams at will and that the speed is controllable and reversible. The beams dissipate quickly.I used this at my daughter's wedding and the beams never reached the wall 35 ft away. If the Rotosphere is mounted on a stand in the up right position there is a dead spot of light on the floor with most of the beams on the ceiling. I think it would work better inverted. It weighs about 8 lbs so mounting it solo on a tee stand would tricky. I will recommend this product but be aware it is not a replacement for a mirror ball. I give Chauvet an a for effort, it was a great idea if it worked just a little better and was Bill just a little different, the rotosphere would be an awesome addition to anybody's lighting rig, the lights on the rotosphere are powerful and do a great job lighting up the room, definitely a great idea to take the place of a mirror ball and pinspot. But and this is the only drawback to it, the mechanism that turns the rotosphere definitely could use Improvement. It's not a totally bad machine, it's not a totally bad idea, if they could redesign the mechanism that turns the ball and make it a little more foolproof they would have a fantastic 100% Five Star Machine. This light can be used for slow mood setting or for fast dance.The optional remote works great and is simple to use.Would definitely recommend this to any DJ Band or Venue!